San Jose, CA- The San Jose Giants announced today their new San Jose Churros identity for the Copa de la Diversion initiative. The San Jose Giants become the San Jose Churros on four nights throughout the season including: May 3, June 29, July 6 and August 10. 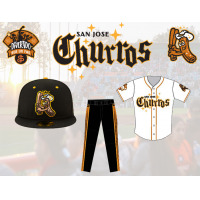 The Churros will special themed jerseys, hats and even pants with "churro piping". For every game, the first 100 fans through the gates will receive a free Churro, and there will be gate giveaways on July 6 (Churros Cart) and August 10 (Churros Plush Doll). 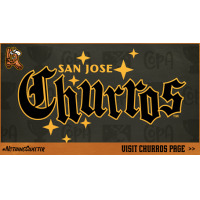 For complete information fans can visit the San Jose Churros page on sjgiants.com. Fans can purchase their tickets for San Jose Churros nights now on sjgiants.com, at the San Jose Giants Box Office or by calling 408.297.1435. The San Jose Giants 2019 home-opener is Thursday, April 11, 2019 at Municipal Stadium versus the Visalia Rawhide. Single game tickets, ticket packages and season tickets are all on sale now! For more information, visit sjgiants.com or call 408.297.1435.